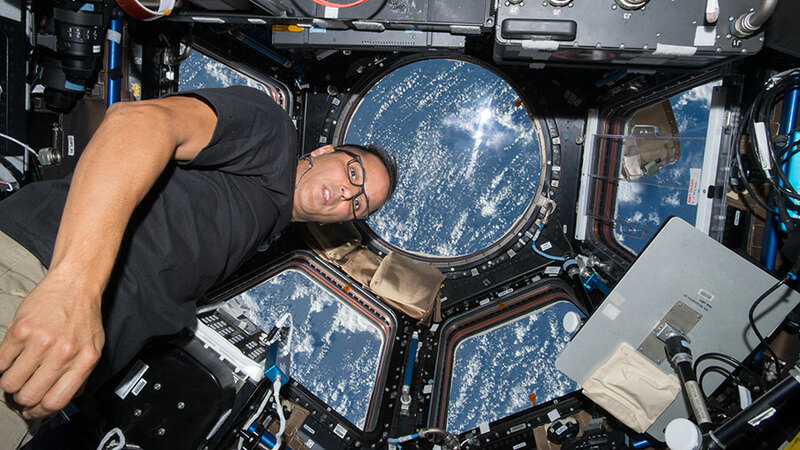 NASA astronaut Joe Acaba works inside the cupola as the space station orbits above the Indian Ocean near Australia. The Expedition 53 crew members continued testing a new exercise device today while also exploring how their bodies are adapting to living in space. The station residents are also gearing up for three spacewalks planned in October. Commander Randy Bresnik joined Paolo Nespoli for a workout session on the new Miniature Exercise Device-2 (MED-2). The duo tested the MED-2 for its ability to provide motion and resistance during crew workouts. The device is significantly smaller than previous space exercise systems potentially providing more room on future spacecraft. Flight Engineer Mark Vande Hei installed new lights on his crew quarters to test their ability to improve circadian rhythms, sleep, and cognitive performance. NASA astronaut Joe Acaba collected and stowed his blood and urine samples for a pair of experiments observing the physiological changes taking place in space. Bresnik and Vande Hei are moving ahead with preparations for the first of three spacewalks set to begin Oct. 5. The spacewalkers inspected the tethers that will keep them attached to the station and began setting up their tools. The duo will remove and replace a leading end effector on the tip of the Canadarm2 during the first spacewalk scheduled to last about 6.5 hours. My grandaughter and I watch excitedly every night as the Space Station flies overhead!! It’s amazing to see how fast it flies!! Keep up the good work guys!!! We love you!! when will you launch your next rocket????? SpaceX is targeting Dec. 8 at 1:20 p.m. EST to launch its Dragon cargo craft to the International Space Station.